Deposit bitcoin into the Bitconnect platform website. Trade it for Bitconnect Coin (BCC) using the platform’s exchange. Sit back and watch profits from the interest roll in. How much easier could moneymaking be? According to its Announcement (ICO) thread on bitcointalk.org, “BitConnect coin is an open source, peer-to-peer, community driven decentralized cryptocurrency that allow (sp.) 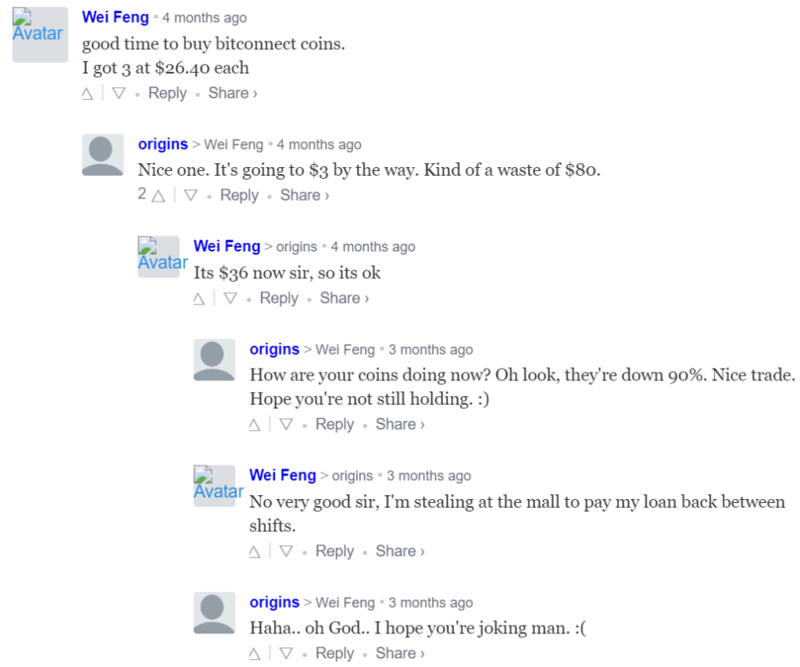 people to store and invest their wealth in a non-government-controlled currency, and even earn a substantial interest on investment.” The interest was so substantial that the same OP also claimed, “the moment you acquire BitConnect Coin it becomes an interest-bearing asset with 120% return per year through PoS minting.” To put things in perspective, Bitconnect offered a return on investment 10 fold greater in magnitude than that of convicted felon and Ponzi schemer Bernie Madoff. Bitconnect lending structure as published on their webpage. Though it started off with a simple, ambiguous mission statement, Bitconnect evolved into a moderately successful lending platform, making many of its ICO participants quite wealthy in the process. In addition to collecting interest from bitcoin deposited into the Bitconnect platform, users had the chance to profit off successful referrals to the system, based on the amount of money the referrals were willing to “invest” into the system. The Bitconnect referral hierarchy looked amazingly like a pyramid – which is exactly what it was – a multilevel marketing or Pyramid scheme. 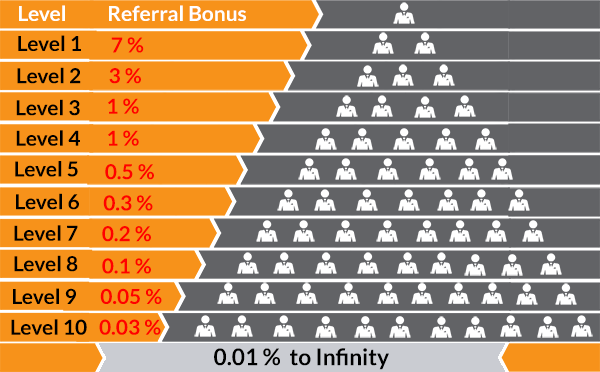 Pyramid-like structure of Bitconnect’s referral program, from their website. By August 2017, severe doubts as to whether Bitconnect was a legitimate operation or a Ponzi scheme took hold of the user community, regardless of the fact that Bitconnect Coin (BCC) had achieved a $600+ million market cap with apparently no sign of slowing down. After taking the time to further analyse the Bitconnect project it is still unclear who is behind the project, exactly how it works, or if BCC has any actual use. Bitconnect also employs a number of dubious methods in order to operate and promote its business. The business model outlined by the company is economically unsustainable with the current level of returns unable to be validated by any legally known investment system. The Bitconnect project also generates a large amount of negative feedback from within the cryptocurrency community with accusations that the project is actually a “scam” or “Ponzi scheme” being actively discussed. As a result, we have taken the decision to distance ourselves from this project, remove it from the top 100 by market cap list and place a warning on Bitconnect page. Yeah, if 1%/day is what they offer then that’s a ponzi. 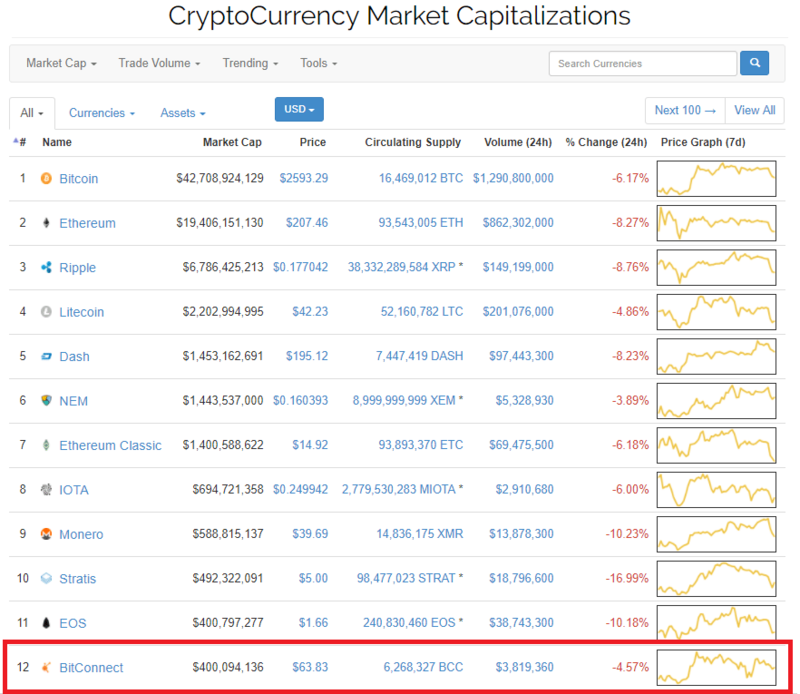 Buterin’s un-endorsement quickly led to the largest crypto ranking website CoinMarketCap’s decision to re-adjust the capitalization value of Bitconnect based on the circulating supply of coins (as opposed to the total supply), causing it to fall from $1.9 billion to $596 million over 24 hours, wiping off approximately $1.3 billion of its estimated worth. With a single tweet, the association between Ponzi and Bitconnect would be forever cemented, being caught in the eye of the media, which was happy to explain how its referral system was unsustainable while pointing out other red flags inherent in a Ponzi scheme. A flood of new and longtime critics on bitcointalk likely helped others save thousands or even millions of dollars that were about to disappear into the wind. While the price per BCC coin continued to soar, rising some 80% from November 2017 to January 2018, the jig was nearly up, and it quickly became evident that Bitconnect was engaging in price manipulation as the vast majority of all BCC coins were being traded through the exchange hosted on their platform. On January 8th, 2018, Bitconnect was served a cease and desist letter by the state of Texas, soon followed by class action lawsuits filed on behalf of investors in several other states where concerns and losses had started to mount. BCC lost 25% of its value in 5 days time, and then what is likely the biggest collapse of any crypto market ever occurred when BCC lost an additional 95% of its value, dropping from $300 to $16 in about a week’s time. A combination of legal pressures and a rapidly declining price of BTC – as well as ever-mounting criticism and scrutiny from the community – are what finally did the Bitconnect Ponzi in. It had paid out consistently for well over a year, which is pretty amazing by Ponzi scheme standards. 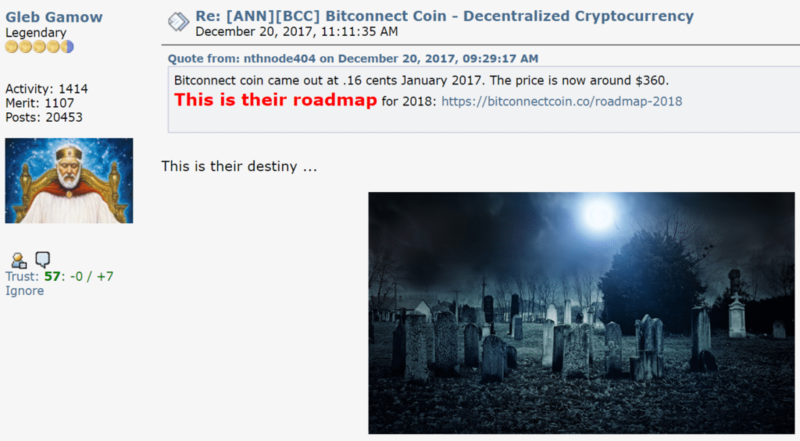 But in the end, in spite of all the promises of legitimacy from team members and devotee users alike, Bitconnect proved to be nothing more than what many had suspected all along: a complete sham. Lives were ruined, many losing not just their respect from friends and family members they had unwittingly suckered into one of the biggest crypto scams of all-time, but their life savings as well. Mortgage payments, college education funds and giant-sized loans all disappeared overnight as Bitconnect shuttered its doors; the anonymous team members making off with a trove of user-deposited BTC and disappearing into the moonlight. Though the original masterminds behind Bitconnect are thought to be based in Indonesia, they have yet to be identified or brought to justice. Scattered among the wreckage of ruined hopes and dreams are a few legal proceedings against representatives of the Ponzi scheme in America, who used their social media sway over the crypto community to lure them into losing vast amounts of money in the scam. We wish the story had a happier ending: that investors got their money back, that the Bitconnect team was brought to trial, and that they sincerely regretted their actions, saw the err of their crooked ways and promised never to do it again. However, this was not the case, and with our next week’s story of Ethconnect (imagine Bitconnect but with Ethereum instead of bitcoin), we will explore an even deeper level of human greed than you perhaps previously thought was unimaginable. So until then dear readers, stay tuned, stay sharp, and stay away from scams!